The formal literature of science has traditionally acted as a “ledger” where debts are acknowledged, previous works are cited, and advances in knowledge are claimed. Recent innovation in electronic publishing, as well as open access requirements from funding agencies in the life sciences, is making it possible to examine this ledger more closely: we can now more definitively ask who is acknowledged, where do citations appear, and what knowledge is claimed within an entire discipline, journal or archive of publications. In this chapter, the authors explore the ledger of bioinformatics, asking how two paratexts—acknowledgment and authorship statements—can be used to understand credit and collaboration within this unique field. In the late 1980s a cultural turn in sociology produced many new and exciting areas of study, including the interdisciplinary sub-field of Science and Technology Studies (STS; Van den Besselaar, 2001). Anthropologists, information scientists, political scientists, sociologists and even historians were brought together by STS’s research agenda, which moved away from the structural study of institutions or norms of science towards studies of “knowledge production” (Van House, 2003). Influential work in early STS included David Bloor’s Social Study of Knowledge (1991) and innovative modes of societal inquiry that demanded self-reflexive interpretation (Pinch & Bijker, 1984; Ashmore, 1989), as well as a symmetrical treatment of the power dynamics between humans and material objects (Callon, Law, & Rip, 1986; Callon, 2007). As part of this cultural turn, the phrase technoscience (Latour, 1987; Bowker, 1994) was often used to denote the hybridization of technical and scientific knowledge that was difficult, if not impossible, to completely disentangle in many of science’s workplace settings, including the laboratory. Studies of technoscience were meant to focus on the emergent properties of science-in-action, emphasizing yet another turn: away from simply studying the artifacts of knowledge production, and instead moving towards a study of people and materiality that are inextricably bound up in inscription devices (Latour & Woolgar, 1979) and information infrastructures (Lee, Dourish, & Mark, 2006; Pinch, 2010). Many contemporary studies of technoscience have acknowledged the increasingly blurred line between the production of an accepted form of knowledge (epistemology) and the objects used to produce a new knowledge claim (ontology) (Lynch, 2013). This uncertainty in the distinction between ways of knowing and knowledge products has created something of a dilemma for cultural studies of science: to focus on one set of practices, one domain of knowledge, or one type of information system over another is to greatly miss the dynamic interactions that the infrastructures of technoscience afford. To put it another way, if social scientists are to study networked, highly collaborative practices in order to better understand the fuzziness of epistemology and ontology in a technoscience, then local, single-sited ethnographic methods traditional to STS research—even those of a digital or virtual orientation (Hine, 2000)—will be necessarily limited. Methodological innovation, as well as time deepening strategies, are needed to accommodate a horizontal exploration of a knowledge domain over time, as well as a more vertical, in-depth exploration of a single discipline or controversy during a specific point in time (e.g., Menchen-Trevino, 2013; Geiger & Ribes, 2011, Karasti, Baker & Millerand, 2010). Our ambition is to contribute to a line of methodological innovation in social studies of science by using a combination of qualitative and quantitative approaches to support the close reading of scholarly texts. In this chapter, we focus on paratexts that translate the doing of science into textual accounts that report the results of those doings. We pay particular attention to two paratexts—acknowledgment and authorship statements—found in a corpus of bioinformatics publications. 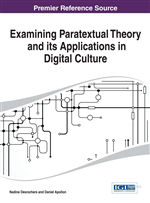 The questions we want to ask in using these paratexts are not just who gets to be an author, but how do authorship and acknowledgment practices reflect the culture of a technoscience? Do these documentary practices evolve over time, or are they rigid and engrained in long-standing tradition of acknowledgment?